On 26th November 2016, we found ourselves as a family facing news that we never thought we’d face. Our Dad had been suffering from stomach pains for a few weeks which became progressively worse and so unbearable that he went in to hospital. Within hours of been at the hospital after a few tests, Dad was told he’d got Bowel Cancer and was taken in to surgery. With no warning prior to his diagnosis, we had caught the cancer at a later stage. During the surgery, Dad had a stoma bag fitted as the tumour had grown so big that it couldn’t be removed completely. This was the start of a long and tough 10 months. As Dad was diagnosed at the end of November we didn’t know how Dad would recover from the operation or deal with having a stoma bag. We had lots of things planned in December on the lead up to Christmas. Once Dad was out of hospital he surprised all of us and joined in with all our plans as much as he could. We made some fantastic memories not knowing if it would be our last Christmas together. Once Dad had recovered from the operation he started chemotherapy in January 2017. We were told this would never be a cure but would help prolong his life. Throughout all the chemotherapy, Dad was always so proud despite everything he was going through. Dad tried different types and dosages of chemotherapy over a few months as some of them didn’t work but he was willing to try anything. He was constantly fighting his battle with cancer along with a wicked sense of humour! After an extremely tough couple of weeks in September and Dad putting up a huge fight, our Dad sadly passed away on 20th September 2017 at the age 55 and he will be forever missed. As a family we made some fantastic memories in those last 10 months we had with Dad and we’ll treasure them forever. We cannot begin to explain the emotions we’ve been through and the daily battles we go continue to face after this huge void in our lives. We still can’t quite believe this is us writing this and we are talking about our Dad. But we do know that we are so proud of our Dad for everything he did for us. We know he’s with us every day. 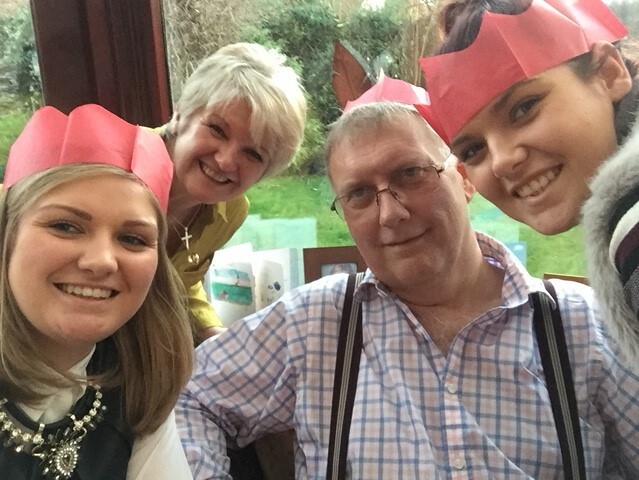 However, as we face all the ‘firsts’ together as a family, we decided that for Father’s Day this year, we’re going to do the Pudsey 10k run in memory of Dad and to raise awareness of bowel cancer as well as raising money for a fantastic charity. We know Dad will be with us as we take on the Pudsey 10K and we promise you Dad we won’t argue - well at least not for the first 5K!!! Since Dad’s diagnosis and the operation, Dad found wearing belts uncomfortable and decided to try wearing trouser braces. We thought he looked brilliant in them and he bought different colours and patterns to match his shirts. In honour of this and to fundraise for Bowel Cancer UK, we are in the process of creating “Braces 4 Bowels”. We are currently liaising with a Company and supplier of the braces. Our idea is to have the braces printed on in different patterns and colours and sell them to raise money and awareness for Bowel Cancer and stoma bags. Our journey is one that no family should have to go through but sadly there are others who will be going through the same as you read this. Our ambition is to carry our Dads fight on through our charity idea, in hope that we can prevent others from going through the pain we have all had to suffer. Our Dad was a remarkable man and no words will ever begin to explain our loss. We promise you Dad we won’t argue - well at least not for the first 5K!! !